A new, handheld ultrasound (US) system, enhanced US image-processing software, new features for a positron emission tomography (PET)/computed tomography (CT) system, and a corporate acquisition top recent radiology news. SonoSite Inc. (Bothell, WA) recently introduced its third-generation handheld ultrasound system, the MicroMaxx (Figure 1). Designed for a range of clinical applications, the 8-lb, laptop-sized unit used the company's proprietary Chip Fusion Technology. According to product manager Jeremy Wiggins, "We are able to take very complex processing algorithms that are normally dedicated to multiple microchips or multiple circuit boards on a larger system and merge a number of functionalities on to a single custom ASIC (Application Specific Integrated Circuit) microchip, or, in some cases, on to a couple chips." In the MicroMaxx system, the 128-channel beamformer is integrated into 4 proprietary postage-stamp-sized ASIC chips. This broadband beamformer supports a variety of transducers for a range of clinical applications. Transducer options include an adult phase-array transducer for cardiac applications, a curved array transducer for abdominal and obstetrical (OB) scanning; a linear array transducer for imaging of the breast, small body parts, and nerves, as well as vascular intima-media thickness (IMT) measurement; an intracavitary transducer for OB and gynecologic (GYN) examinations; and a transesophageal probe for transesophageal echocardiography scanning. "There are multiple software packages available, depending on the configuration needed," noted Wiggins, "Applications include anesthesiology, cardiology, emergency medicine, OB/GYN, preventive cardiology, radiology, surgery, and vascular imaging." According to the company, the MicroMaxx can power up from off to scanning in approximately 12 seconds and can operate for up to 4 hours on battery power, depending on the use mode. A docking station is available for recharging the battery and for Digital Imaging and Communications in Medicine (DICOM) connectivity. "You can also be connected without the docking station with an available attachment," explained Wiggins. "In addition, we are looking at wireless technology as a natural extension for our product in terms of true mobile ultrasound. However, we do not yet have that in the initial release." "This is our new flagship product," concluded Wiggins. "MicroMaxx has been built on a proprietary third-generation ASIC chip set that we can leverage in many different ways. The first opportunity of leverage is MicroMaxx, but this is just the beginning. This is a very expandable platform for us." The cost of the system ranges from approximately $45,000 to $65,000, depending on the software and transducer configurations and includes a 5-year warranty. The company expects to begin full commercial shipping in mid-June. Medison America, Inc. (Cypress, CA) recently introduced the latest imaging processing solution for the company's Accuvix XQ 3D US scanner. 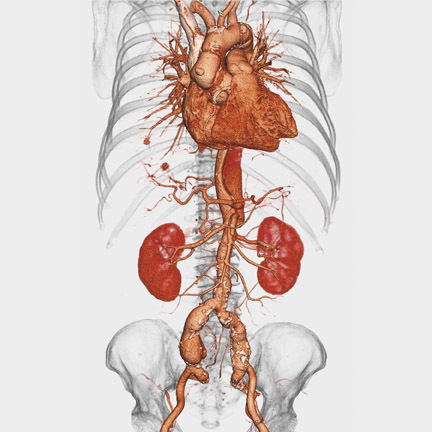 The 3D-eXtended Imaging (3D-XI) package includes 3 new imaging applications: Multi-Slice View, Oblique View, and VolumeCT. The Multi-Slice View application allows the 3D ultrasound images to be displayed as serial slices (Figure 2), similar to that of magnetic resonance (MR) or CT scans. The user is able to select the slice thickness, from 0.5 to 3.0 mm, and the number of images to be displayed. Unlike conventional 2D ultrasound, significant probe manipulation is not required as the data is acquired while the probe remains still. The Oblique View application allows the user to view the 3D data in various planes without limitations. The VolumeCT View feature with Cross View and Cube Sectional View functions enables the user to perform multiple examinations on multiple regions of interest and visually display the relationship of coronal, sagittal, and axial views of the 3D dataset. Each scan plane, as well as the entire volume dataset, is interactive. According to the company, this results in a more precise orientation of the displayed intersecting anatomical data. In the field of molecular imaging, Philips Medical Systems (Bothell, WA) unveiled several enhancements for its Gemini PET/CT systems at the Academy of Molecular Imaging Annual Conference 2005, March 18-23, in Orlando, FL. 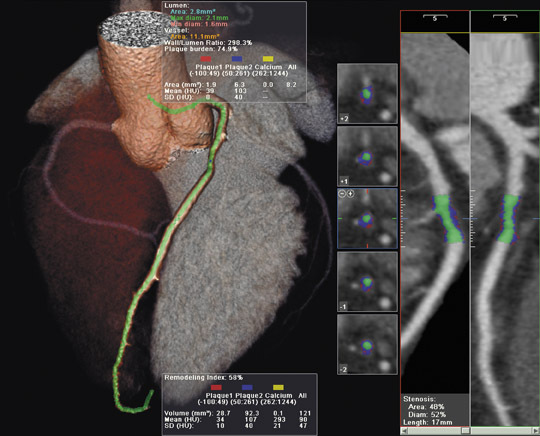 These new features include a cardiac review and analysis package, list mode acquisition and data management tools, and gated acquisition for cardiac and respiratory applications, as well as new DICOM connectivity features. These features are available now on the Gemini 16 Power and will be available on the Gemini Dual later this year. "With the new product enhancements, Philips is reinforcing its commitment to the advancement of the Gemini PET/CT technology for both our existing and new customers," said Ian Farmer, Nuclear Medicine Senior Vice President and General Manager at Philips. "These upgrades will help customers improve workflow efficiency, provide additional clinical applications, and facilitate better patient care." The Gemini family of products features the company's proprietary OpenView gantry, full 3D PET acquisition and reconstruction, and a scan length of 190 cm for both PET and CT.
Siemens Medical Solutions USA, Inc. (Malvern, PA) and CTI Molecular Imaging, Inc. (Knoxville, TN) have entered into a merger agreement under which Siemens will acquire all the businesses of CTI Molecular Imaging, including CTI PET Systems, PETNET Solutions, CTI Mirada Solutions, CTI Molecular Technologies, and CTI Concorde Microsystems. Following the merger, CTI Molecular Imaging will become a wholly owned subsidiary of Siemens Medical Solutions. "This step is a natural progression in our long-time association with CTI, and reflects Siemens' overall strategy to transform the delivery of healthcare by developing trendsetting innovations that improve patient care while reducing costs," said Erich Reinhardt, PhD, President and CEO, Siemens Medical Solutions. "Molecular medicine will result in more individualized and more effective diagnosis and therapy," added Michael Reitermann, President of Siemens' Nuclear Medicine Division. "CTI Molecular Imaging has been actively engaged in next-generation molecular diagnostics research and the development of new imaging technologies and biomarkers. This acquisition will enable Siemens to strengthen and broaden our capabilities in molecular imaging, and define new standards within the industry." "This acquisition represents the combination of two companies that are innovation leaders. It will benefit PET imaging's continued advancement as well as enhance the future of molecular imaging," concluded Ronald Nutt, PhD, President and CEO of CTI Molecular Imaging. The transaction, which is valued at approximately $1 billion, is subject to customary regulatory approvals and closing conditions, and is expected to close in the second quarter of 2005. Technology and Industry: Ultrasound and molecular imaging news. Appl Radiol.